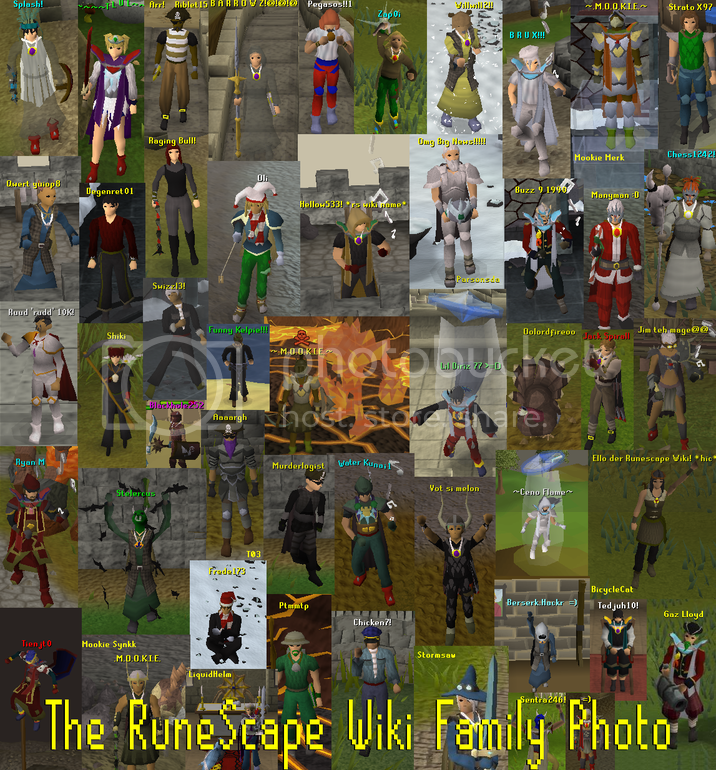 6 RuneScape Wiki Family Photo! 24 Re:Aww I missed it. The Bukkit has given me all sorts of powers. Stop making me feel dumb. (Bit of a copypasta but whatever). Hey, I wonder if you could help me with something? You may have known that I've had a max hit calculator in my userspace for some time now, which I was waiting for a reliable formula for the extreme potion boosts before moving it into the mainspace (procrastinating on finding it on the forums tbh). Recently, Tyilo (who did not know of my version) created a melee max hit calculator for the wiki. We both think that each others calcs have extra things that the other's doesn't, and aren't sure which should be in the mainspace. It don't matter if yew liek it or not, it matters if I like it as I am significantly epicer then you. Swizz Talk Events! resiant and inhabiting within and neere vnto the _Sownde_ in the kingdome of _Denmarke_, commonly called the Marchants of the _Hanse_ townes, wil grieuously exclaime among forreine Nations, against the chiefe Commanders of the Fleete of the most excellent Queene of England, as infringers of the law of Nations, and of the ancient contracts made betwixt the Kings of England, and the _Hanse_ marchants, and as contemners of the Newtralitie which the said _Hanse_ marchants doe chalenge to themselues, whereby they thinke and hold it lawfull for them to exercise the trafique of all marchandises whatsoeuer, with all people whosoeuer, euen in the times of greatest hostilitie betweene whatsoeuer kings and Princes, by reason of the intercepting & arresting of certaine of their ships, passing to the ayde and furnishing of the king of Spaine with corne, and prouisions of warre: it seemed good vnto her foresaid excellent Maiestie, in respect of her good will, together with singular affection and loue to the sacred Empire, the Emperours Maiestie himselfe, the noble Princes of Germanie, and to all & singular the Estates of the Empire, in this publike sort to make it manifest for what causes the aforesaid _Hanse_ ships were stayed by the officers of her Fleete, and as lawfull prises taken and confiscated. Which is done to no other end or purpose, but to make it euident that the same action doth stand & agree with equitie and iustice, and to be a thing most probable, that other Princes whosoeuer, their seruants and Officers in the like case, and vpon the like occasion, woulde not haue failed to take the like course. For it is a thing notorious & sufficiently knowen, not onely to the fewe _Hanse_ townes, but also to all Christendome, that the king of Spaine is transported with a mortall hatred against the Queenes Maiestie of England: a witnes whereof is the intended but not performed inuasion of the kingdome, and Dominions of England by the saide king the yeere last past, furthered by him with all his force, but by the mercie of God vtterly disappointed. Which exulcerate malice of the Kings minde, not lately sprong vp, but of long time lurking in the closet of his heart, yet foreseene and still preuented by the Queenes Maiestie, she often by her messengers sent to him for that purpose, as with most gentle medicines indeuoured to asswage, to reduce him to a newe minde meeter for a Prince, and so great a king as himselfe: to the ende that remouing out of both their mindes not onely the staine, but also the suspition of the staine of discontentments, they might dispose themselues to enter and conclude a firme peace and durable friendship, according to the ancient leagues betweene their progenitours and fathers, and their kingdomes, for the space of many yeeres happily continued. The king as a man bewitched by the bishop of Rome, the very firebrand and bellowes of all the ciuill warres in Christendome, neglecteth the remedies and conditions of peace that haue bene offred, and perseuereth according to his beginning, in his hostile intendement against her Maiestie, not otherwise contentable or satisfiable then with her destruction, the slaughter and bloodshed of her people most obedient vnto her, and to bee short, with the conquest of the whole kingdome. And for the better effecting hereof, hee hath oftentimes sent his messengers (you woulde rather say his fireflingers) into England, & of latest yeeres two speciall persons, of all the rest most eger and furious, _Gyrald Despes_, and _Bernardine Mendoza_, who ceased not to sound and perswade the mindes of all those whome they coulde growe in acquaintance with, and were men giuen ouer to al mischiefes and diabolical practises: promising them, and bestowing vpon them extraordinarie rewards, of purpose to stirre them vp to moue domestical conspiracies against her Maiestie. And how much they preuailed in their attempts, it is not materiall in this place particularly to discusse, for so this worke would growe large. The 3. principall conspiracies, the one of the Earles of Northumberland and Westmerland, and of their partizans, the second of the Duke of Norfolke, the third of the two Pagets brethren, as also of the two Throckmortons and of their confederats, whereof some were condemned and executed, for their intended ouerthrow of the Queenes Maiestie, and of the state of the Commonwealth, and the rest that are fled, and wander vp and downe in vncertaine places, and are to this day mainteined at the charge and by the purse of the Spanish King, are in this matter very sufficient witnesses. But the Patrons and complotters of these rebellious, being subtile and cautelous in their actions, howsoeuer apparant the factes of their seditious ministers seeme to bee, yet peraduenture the Spaniard himself wil denie them to be his precepts, and directions. Did he then chastise those his ministers being returned into Spaine, as transgressers of his pleasures? Did hee detaine from them all rewards and preferments, as hauing ill deserued them? hath he blamed the auctours of such facts, and excused himself to the Queene? I would to God it were so. But goe to, let these witnesses passe. May hee be taken for a man of a good spirit, & of no poysoned minde against her Maiestie? Let then _Guilielmus Cataneus_, the Popes Secretarie that now is be produced: let his worke of the life of _Pius Quintus_ sometime bishop of Rome be read. The saide _Cataneus_ in that booke of his reporteth, that Philip the king of Spaine complained bitterly and with great griefe to the Cardinall of _Alexandria_, sent vnto him into Spaine in the yeere 1572. because the conspired practise, as wel against England as Ireland, not long before entred vpon by his authoritie and aduise, had not that successe that he looked for. Adde hereunto the ships and forces sent twise out of Spaine into Ireland vnder the pretext of the Popes name. As for the late treatie of peace with the Duke of _Parma_ in Flanders, entred into vpon the mediation, and request of the good prince the King of _Denmarke_, how smoothe & how slie a tuche was that? for her Maiestie, being wholy bent to that treatie, with a sincere minde and vnfayned desire, beholde as then at her doores, that huge & mightie Fleete of Spaine, beholde a sort of Armies brought out of Italie, and Germanie into Flanders, labouring and prouiding for nothing els but the desolation of the kingdome of England, and the destruction of the Queene: for the Conspiratours had as it were with their fingers, appointed euery one of vs to the slaughter: they had distributed our houses and lands, and a newe Prince, a forrener was already ordeyned & created to enioy the kingdome. If the Spaniards seeme to obiect against these so grieuous, so deadly, and so strange deuises, the succours which her Maiestie hath yeelded to the lowe Countreys, let them consider well, and they shall finde, that most of these practises haue in time preceded the transporting of any ayde to them: let them denie (if they can) that they sollicited many English Subiects to rebell, before her Maiestie, so much as thought, of the relieuing of her auncient confederats, by her honest and iust meanes. She appealeth to the King himselfe, and to his _Vice Royes_ in Flanders, how often, and what messengers she sent before that into Spaine and Flanders, for breeding a concord and agreement betwixt the King, and the Nether-landers, not with hard, but with honourable and equall conditions: against which _aduisoes_ and requests, when the King began to be obdurate, and the ancient contracts of amitie betwixt the Nether-landers, and the Kings of England could not suffer them to be depriued of their lawes and libertie, and be exposed as a pray to Strangers, she at the last receiued them, being too much oppressed into her protection, onely of a desire to releeue the poore afflicted people, and not to offer the smallest iniurie to the King. For if she had bene disposed to regard her owne commoditie, she might haue taken another course, but she did not so: seeking rather as yet, earnestly, and diligently with any conditions, if not too vnreasonable, and such as may stand with her honor, and the profite of the state of Christianitie, howe a commodious and secure pacification may be made betwixt the King, and the States of the lowe Countreys. In vaine, and contrary to reason, hath she maintayned with great charge, that honorable Ambassage to the Duke of Parma the last yeere: in vaine was she aduertised of the monstrous Nauie of Spaine, and the miraculous swarmes of forces with Parma in Flanders, destinated & prepared for her ruine, and the spoile of her kingdome: she remained stil without all intention or disposition to send any further forces into Flanders, and was after a sort negligent, both of defending herselfe, and of extending the limits of her gouernement beyonde the Seas, with purpose to liue in quietnesse without feare, and in peace without ambitious desire of rule. And howsoeuer she may be thought greedie of other mens Dominions, she sent to Parma very noble and excellent Ambassadours, who being delayed from day to day, from moneth to moneth, without any thing accomplished, she notwithstanding tooke it patiently, and suffered so farre these dangerous delayes, that the Spanish Souldiers panting with haste and greedinesse for the blood and butcherie of her Maiestie, and people most deare vnto her, were come vpon her coastes, and before her doores. In this sort was her hope deluded, and her opinion frustrated by him, contrary to the royall dignitie of both the Kingdomes of England and of Denmarke. And if the victorious hand of God had not herein derided the cunning deuises and purposes of the Spaniards, if it had not scattered so great a terrour to all Christendome, and drenched their carkases in the Sea, what should the state of the said Hanse marchants haue bene, so busily and so contrary to al equitie and iustice, hastening to furnish him with corne & prouision for the warres? whither should the long and sacred quiet of the Romane Empire haue gone to hide it selfe? where should all other Nations that professe the trueth of Christianitie, thinke that they might haue shrowded them selues to be free from his tyrannie, and safe from his murderers and cruel executioners? If they saw not that their owne destruction was ioyned with the ruine of the Queene of England, either it must be saide that they woulde denie Christ, or that they were blinded to their owne miserie by the vengeance of God, for their secret sinnes. For where the cause of hostilitie is all one, the like effect and issue is to be looked for at the hands of a cruell and raging enemie of the trueth: for in a maner, all the inhabitants of the Hanse Townes are very good fauourers of the reformed Religion, and mortall enemies to the Romish errors. And would any man then beleeue, that men so well instructed, coulde more respect their priuate gaine, I will not say their filthie lucre, then their owne securitie, the preseruation of their Countrey, and the propagation of true Religion? But what? will the inhabitants of the Hanse Townes pretend that they knewe not the Queene of Englands pleasure? The Citie of Hamborough by their letters written vnto the Queenes Maiestie, the 21. of September, in the yeere 1585 hauing besought her, that their ships might passe quietly vnto Spaine and Portugal, without stop or hindrance either in their passage or repassage, by her Maiesties Captaines at Sea, receiued not they answere to this effect? Secondly, whereas two yeeres after that, to wit, the last yeere the saide Burgomasters of Hamburrough sent _Sebastian Berghen_ their Secretarie and _Agent_ with letters vnto the Queene of England, desiring that vnder the colour and title of Newtralitie, they might freely passe into Spaine and Portingal, and repasse againe with al kind of marchandise whatsoeuer, was not the said _Sebastian_ answered in this wise by the Lordes of her Maiesties Counsaile? Moreouer it is not to be omitted, that the Lords of her Maiesties Counsell aforesaid, hauing called for _Maurice Tymberman_ resident in London, and Alderman (as they call him) of the Stilliard, commanded him to giue warning to all the _Haunse_ Townes that her Maiestie willed, and according to her Soueraigne auctoritie in her Dominions, commanded that they shoulde forbeare from thenceforth, from the beginning of the moneth of Ianuarie last past from carying of corne, and generally of all prouision of warre, cables, mastes, and like marchandise into Spaine and Portingall, whereby the enemie of her Kingdome might be the better furnished, vnder the paine of losse both of ships and goods, to be inflicted vpon such, as should violate this her princely commandement. That the _Haunse_ Townes were not ignorant of this inhibition, appeareth by the letters of the Cities of Lubecke, and Hamborough, written afterwarde to the Queenes Maiestie, the 26. of March, and from Dantiske, the 13. of the saide moneth, before those ships set out from home, which are now taken. The same in like maner is apparant, by many bils of the hiring, and freyghting of their ships, wherein among others, this one thing is worth the noting, which was there found, that they couenanted in plaine words, with the shipmasters, that they should not passe into Spaine & Portingall through the English Chanel & vsuall way, but on the backe side of the Kingdomes of Scotland, and Ireland, a newe and strange, and without doubt, a dangerous course: by which their intention and deede, they declared howe litle they cared for good meaning, and how carefull they were to arme and furnish the common and knowen enemie of the Queene of England. But as alwayes for the most part it falleth out, deceite doeth neuer thriue with any man, and when men thinke most to deceiue, they are deceiued, and suffer the penaltie of their guile: for falling into the handes of her Maiesties armie vpon the coast of Portugall, and euen in the entrance of the hauen of Lisbone, they were brought backe into England, and by the lawe of Nations, are become prises to him which tooke them. Here now they cry out, that the Commaunders of our Fleete haue delt iniuriously with them, they exclaime that the leagues are broken, that their old priuiledges in England are violated, which they chalenge to belong to their Cities, and ought to be kept and mainteined. As though that any man were so madde, so farre from the trueth of things, so carelesse of his owne safetie, so great an enemie to publike securitie, that with all his might and indeuour, would not preuent the mischiefe and destruction hanging ouer the Commonwealth. He that withstandeth not wrong when hee is able, is in as great fault, as if he destroyed the Commonwealth. The preseruation of the people hath bene euer accompted among all nations, for the very supreame Law. Are not the _Hanse_ townes ashamed to maintaine and pretend a priuiledge, that is to say, a priuate lawe against a publike and soueraigne lawe? Did euer any king or Prince witting and waring, suffer such a kinde of trafike which should make his enemie ouer mightie, and though hee did not disfurnish himselfe, yet shoulde leaue himselfe more open vnto his furie, which otherwise were like to be vnarmed and vnable to wage warre against him? In the yeere 1545. at which time the warres grew hotte betwixt the kingdomes of England and Fraunce, when the subiects of _Charles_ the Emperour the fift of that name of noble memorie, would needes haue had free libertie of passage with all commodities into Fraunce, vnder pretext of their Newtralitie, What was the Emperours answere being a Prince of great equitie? Did he not openly pronounce that course of theirs altogether vnlawfull? let the Contract it selfe concluded the 6. day of April be lookt into. When the Kings of Denmarke, and of Swethlande were at difference one with another, was it permitted to these Hansemen to conuay freely any thing into one of their kingdomes, which was not in deede ceased vpon & confiscated, if it fel into the laps of the other, not hauing first obtained speciall libertie for the same? Was this stately, & so much priuiledged name of Newtralitie at that time, of such force, that without vsing of any mediatour, it could recouer againe their goods out of the hands of the Danes & Swethens, & countenance the same in safetie, & securitie? Let them acknowledge that, whereof they are not ignorant, that although the Emperour _Ferdinande_ and other Princes of the Empire dealt in their behalfe by way of intreatie and mediation, and that from the solemne assemblie of the said Empire, yet they in this case preuailed nothing at all with _Ericke_, the king of Swethland. And further in the time of hostilitie betwene the Empire, wherewith as then the king of _Poland_ ioyned against the great Duke of Muscouie, went these matters otherwise then? Could either the English marchants, or anie other frequent the _Narue_ in _Liuonia_, or any other partes of the Dukes dominions freely, and without daunger? Did the Hanse men which then were for their king and Emperor, deliuer and restore againe the shippes which they had intercepted and taken, from those which made such attempts? Many mens goods surprised by the Hanse men and others, as then intertained against the _Moscouite_, and by them still detained, without anie precedent prohibition of passing to the said _Moscouite_, are hereof very good witnesses. It is also a thing well knowen, that the noble Prince of _Orange_, and the States, exercised the like iustice, as well against the Hanse men, as others in times past. And verely the foresaid Princes in these arrestes did that which was according to the tenour, and prescription of the lawes of the equitie of nations. For that same priuiledge of Newtralitie, is in such sort to bee vsed and inioyed, that in helping one of our confederates, we hurt not another: so that hee which helpeth one, & thereby damnifieth another, falleth from his priuiledge and contract: not because he helpeth one of his confederates, but because he doeth preiudice another, and by that fact of his, makes himselfe an enemie, as offering the first iniurie, and therefore in so doing, he is to bee taken and reputed for an Adherent, and Assistant to the enemie, and a very enemy himselfe. This then beeing the state of these thinges, what lawe, what reason, or example may be obiected to the contrary, but that it is lawfull for the Queene of England, whose scepter, diademe, kingdome, liuing, and life, are greedily thirsted after by the Spaniard, so potent and so malicious an enemie, to doe that against his fautors and fauourers so often premonished, which was lawful for the Emperour, for the Empire, for the king of Swethen, for the king of Denmarke, for the Prince of Orange, for the States of Netherland, yea for the _Hanse_ men themselues to doe in the like cause, but not in the like danger, and extremitie as this is. Nay, if wee thought it requisite to alleadge any thing out of the priuiledges themselues, whereof they haue so often, and so much complained, as being many yeeres withheld from them by iniustice, wee might offer the charter of _Edward_ the first king of England, to be perused, granted in the third yere of his raigne: in which charter wee reade these expresse wordes. So that either they must denie, that the king of Spaine hauing practised such cruell and horrible things (I would to God we might not say stil practising the same) is an enemie to the Queene of England, or els by the wordes of the aforesaide charter, they must confesse that they are included within those boundes and limites, which they may not passe, if they desire to bee called and accompted friendes. We may adde to all this, that it is a thing able to be shewed and proued in the Courts of Records of the kings of England, that heretofore the warres arising, and continuing betwixt the kinges of England and of Fraunce, the goods of these Hanse men were so subiect here in England to arrestes, as now they are, vntill they grew more warie, and had put in sufficient Sureties, that they woulde not from that time transport any part of their goods into the prouinces and dominions of the French king. By these reasons we take it plainely, and fully demonstrated, that her Maiesties Captaines by Sea, in the present arrest of the Hanse mens goods, haue committed no iniustice against their pretended priuiledges, but rather that they haue vtterly lost them for this pranke of theirs, in causing victualles and martiall furnitures to bee conuayed to the countries of her manifest and notorious enemies, directly contrary to the wordes specified in the priuiledges. Although her Maiestie is not purposed, notwithstanding all present extremities, and this most vile and most barbarous part of the Hanse marchants, to proceede in dealing with them, according to that seueritie of law which iustly she might execute, but is nowe thus farre onely resolued, to confiscate all the corne and prouisions of warre: and as for the shippes themselues, and other sortes of marchandise in them, shee is content to dismisse them for the present. But nowe touching the matter of their priuiledges, for which they keepe such a stirre, in complayning to the Emperour, the states of the Empire, and al other princes els, which neuerthelesse are cleerely found to haue beene broken, and forfeited in the time of _Edward_ the sixt, that most noble and famous prince. The Queene of Englande can sufficiently proue, that these Hanse men haue deserued no benefite or fauour at her hands, euen by the lawes of the Empire it selfe, if her Maiestie thought the argument necessary to stande vpon. It is a very apparant thing, that her Maiestie neglecting and not regarding the vniust pretenses and forged suggestions, wherewith these Hanse men haue charged her among strangers, hath yeelded to them no lesse a benefit of free negotiation, then to her owne subiects, without any other restraint but this, that in liewe and memorie of so singular a fauour, they also on their parts should graunt the like freedome in their portes, and cities to her subiects, and marchantes: and yet like vnkinde people, and without respect to this fauour, they returne to their olde byas, & cease not to attempt thinges dangerous to her Maiestie, and by the opinions of all princes in no case to bee suffered. These _Hanse_ men were at the like controuersie sometimes with the kings of _Denmarke_ & _Swethen_, by reason of certaine like priuileges in the kingdomes of _Norway_ and _Swethland_, and the matter grew so hot that it brake out to an open warre: but with what fruite or gaine to the state of the _Haunse_ men? This was the issue: they were forced to accept such conditions of priuiledges, not as they challenged but as the foresaid kings thought iust, & equal. By which president they might learne if they were wise, not to accept only, but most gladly & thankefully to accept the conditions offered by her Maiestie, as proceeding from such a kind of liberalitie, that may make them in this case superiours to all other Strangers, equall and alike with her owne Subiects. But if they continue in this their stubbernesse and ingratitude, let them take heede least they plucke vpon themselues that most iust reward of their most peruerse behauiours, whereof they haue felt the smart before this, both in _Swethlande_, _Norway_ and _Liuonia_ also. Seeing then these _Hanse_ men haue receiued from her Maiestie many great benefits, but no ill deserts at any time, shee desireth the Emperours Maiestie, and the rest of the Princes and States of the Empire, to giue no credite to the rumours spread abroad by them, or by the friendes of the Romish Church, or by such as are corrupted with _Spanish_ pensions, men suborned of purpose to scatter these false surmises, to the ende that we being drawen to a mutual dislike and hatred, they in the meane time may the sooner and the more easily bring vs, and the Religion which we professe (if it were possible) vnderfoote. And further her Maiestie intreateth, that this heauie warre entred into with the _Spaniard_, for the mainteinance whereof no small but huge summes are of necessitie required, and wherein the quarrell is not in her owne behalfe onely, but for the safetie of all the Kings, Kingdoms, and Dominions of Europe that professe the sinceritie of true Religion, and for that cause are as much hated of this Spanish enemie and his Romish Confederats, as her Maiestie is, may at the least in this one thing seeme more tollerable, and lesse difficult and labourious to bee continued, in not suffering the foresaid _Hanse_ men, to transport to the forenamed common enemie, out of their Kingdomes, Dukedomes, Ports and Straights, any victuals or instruments of warre, by ordeyning seuere corrections vpon the rebellious and disobedient, and such as shall dare to attempt the contrary, and to thinke of her Maiestie and her actions, as of a Prince most careful, both of the vniuersall peace of Religion, and of the safetie of all and singular Princes her Confederats, & that they would by ioyning their Counsels & forces in one, vse all their power and abilitie to extinguish the practises of the Romish priesthod, that so a sincere, holy, and largely extending peace, free from treacheries, may be entred, concluded and established throughout all Christianitie, to the honour of Almightie God, and the tranquilitie of all Kings, Princes and Estates, with all increase of happines. In which cogitation, her Maiestie most sincerely and constantly abideth, and will not cease (God blessing her) to remooue all impediments for her part, to procure this good effect according to her honourable desire. But nowe hauing hitherto spoken of the open violence of the Spanish King, and the Bishop of Rome, giue vs leaue to vse a fewe wordes also of another matter not lesse odious then the former, consisting in the subtiltie of the litle foxe: which is a thing so much the more diligently to be lookt vnto, by how much the more close and secret it is, and a thing that creepes farre without many mens knowledge. It is that same priuie legation and sending as it were in corners of certaine falsly termed Iesuites and Seminaries into this kingdome, to withdrawe the mindes of the simple and ignorant people, from their duetifull obedience to the Queenes Maiestie and the Realme. But as these kind of men doe spring of certaine runnagates, and fugitiues naturally borne Subiects, who at home, either for pouertie growe desperate, or by reason of their vicious liues, could not long lie hid: so being nowe sent home againe by the Pope, cease not vnder the habite of their superstitious profession to runne from house to house, from Towne to Towne, stirring vp the people by their whisperings to rebellion, and scattering certaine popish Buls, made and sent for that purpose, teaching the people out of them, vnder the paine of excommunication, and of a curse, that there is no hope of saluation remaining them, except they change their affections, and cast off their due obedience to her Maiestie. Those of her Maiesties Subiects, which being taken with these Buls, and called in question for the same, haue reuealed their practises: and being moued with a conscience of their offence, doe returne to a better minde, and doe forsake that filthie sinke or dunghill of the companie and opinions of Iesuites and Seminaries: are pardoned of their former transgressions, and passe without punishment: but as for those that are rooted in their wickednesse, and remaine stifnecked in their offence, they being demaunded, whether if an inuasion of the kingdome should be made by the Bishop of Rome or the Spanish King, they would (as good Subiects ought to do) stand for the Queene or no, they answere stoutly and proudly, that they are bound whensoeuer it should seeme good to the said Bishop of Rome, to make any such inuasion of the Kingdome, and Dominions of her Maiestie, to assist and further the said inuasion, by al the wayes and meanes they can. I aske nowe of you, what Prince soeuer you be, hauing the authoritie of a Prince, what you would doe with such monsters as these are, giuen ouer after this sort to such diuelishnes? would you suffer the cloke of popish religion and obedience, to exempt such traytors from the seueritie of Iustice? woulde you suffer them to liue, that woulde you should not liue? surely no Prince or Monarche ought or may tollerate such monstrous creatures, except he purposeth voluntarily to neglect good lawes, his people, kingdome, and life; and sinne grieuously against God himselfe. And these are the monsters that are in England committed to execution; howsoeuer the companions of their treasons, by their infamous libels spread amongst the people crie out, and say, they suffer for the cause of Religion onely, and for their consciences. Many of her subiects, and they no obscure men, but some of the Nobilitie, and some others of the degree of knights are witnesses, that howsoeuer they stand catholikely affected, yet as long as they conteine themselues within the compasse of their duetie, & obedience to her Maiestie and the State, are neither committed to prison, nor in any ill sort vsed, only for breaking the lawes of frequenting the Churches, are peraduenture rated at some pecuniarie fine. The ende and purpose why wee speake and publish these things, is to let all good Princes and Magistrates, and others desirous to know the trueth of things, vnderstande howe and by what meanes, as openly, priuily, by force of armes, and practises of treacherie, the state of her Maiestie and of her kingdome is assaulted by the bishop of Rome, and the Spanish King: and therefore howe conueniently and necessarily her Maiestie is drawen to resist this force and to auoyde these frauds, and with what iniurious allegations the execution of lawes and iustice, is as it were torne and rent in pieces, not only by malitious imprinted Libels, but also by painted tables and pictures, signifying I knowe not what monstrous things, resemblances of some barbarous crueltie, as they falsely calumniate and exclaime, to be vsed against the foresaid Iesuites, and Seminarie Priests, that is to say, against men guiltie of high and horrible treason. But as for her Maiestie, she desireth to stand as a person voide of all trueth and credite with good Princes, if she euer punished any of these men with any strange or newe kinde of torment, then is appointed by the prescript of the ancient lawes of this Realme prouided against such persons, as shall be found and conuicted for Rebels and Traytors. I was going to post this on the talk page of that fun Ip guy, but I don't want his talk page to become a forum.